Theatre Of Ice are masters of of the B-monster movie sound. This is raw primitive rock music whose subject matter deals with the morbid and macabre. Features a savage, echoey guitar sound and vocals straight-from-the-crypt. Recorded in a haunted house in the middle of the Nevada desert, THE HAUNTING is made up of 21 tracks with titles like "The Burning Man", "Monsters From Beyond", "A Wagonload Of Corpses", "Brain Damage" and "From The Ruins Of My Mind". The Haunting cassette is presented here in archival form with the permission of Brent Johnson of Theatre Of Ice. 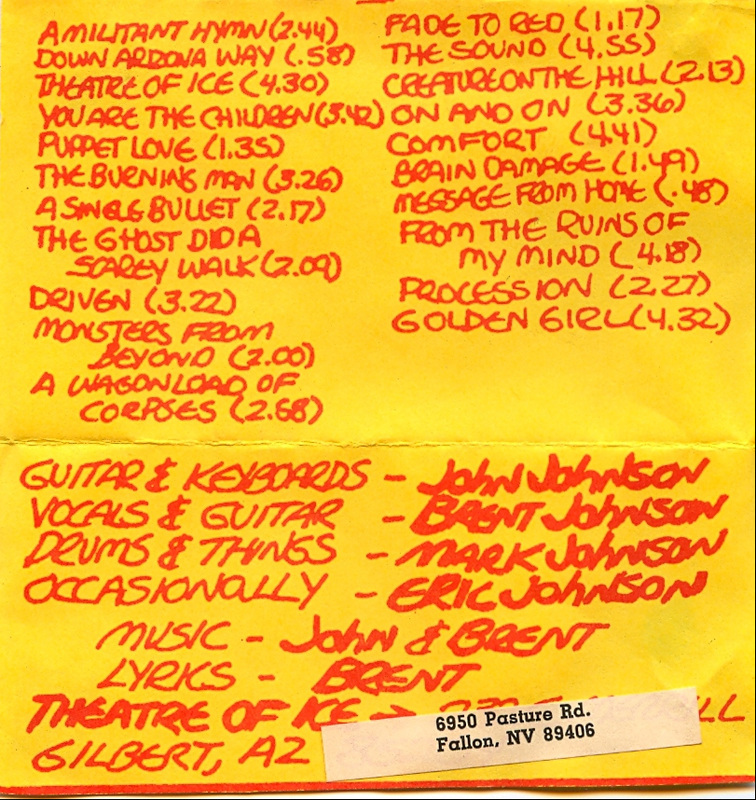 The Haunting by Theatre Of Ice was listed in the January 1985 Cause And Effect Cassette Distribution Catalog. These audio files are straight transcriptions from an original copy of the cassette as it was published in 1983. No attempt has been made to enhance or "improve" the sound quality. Pictured above is a cover of an original copy of The Haunting. The cover has discolored/yellowed due to age and bears the marks of storage and use.